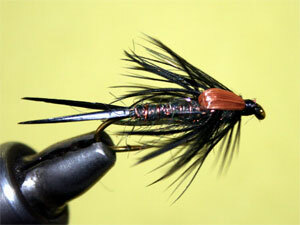 If your a Steelhead Angler in the Great lakes area you must have some Stone Flies in your box. March is the time to fish these bugs, as water starts to warm Stoneflies start to move. I would say most fish we get in March if not on a egg is on a Stonefly Nymph. As in February mostly Hex’s work and occasional Stones. Early April Stones will work but, April is more the month to fish a Salmon or Steelhead Parr pattern. March is time for Little Black Stones. This is a very easy pattern to make and very effective. Enjoy!!!!!! !